The German-Nordic meeting in Berlin was the follow-up meeting of the first meeting in N3 + 1 format, which was held in Copenhagen in November, 2014. The meeting was attended by Swedish Foreign Minister Margot Wallström, Finnish Foreign Minister Timo Soini and German Foreign Minister Frank-Walter Steinmeier. On the agenda were security and regional cooperation in the Baltic Sea region, international crises and the future of the EU after the Brexit. The objective of the so called N3 + 1 format was the informal exchange of viewpoints on a number of foreign policy topics, such as a global EU strategy, Russia, Syria, and Brexit. In addition, the Danish foreign minister put free trade on the agenda for a meeting with the Science and Politics Foundation (SWP) as well as representatives of the Liberal Party FDP. “The Nordic countries and Germany have strong common foreign policy interests. There is therefore a need for a close German-Nordic dialogue and close coordination. The need for close alliances within the EU has not diminished since the Brexit vote. From now on we will meet regularly, once a year”, said Kristian Jensen. “The EU can and must be better in the prevention and handling of global crises and conflicts as we see it in Iraq and Syria. EU populations expect the EU to provide effective responses to cross-border problems. That is why today we want to discuss how the EU can better deal with all phases of a conflict - from the early warning signals to stabilization of closer coordination between humanitarian and development tools”, the Danish Foreign Minister continued. 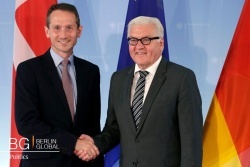 Beyond the joint discussions on the global EU strategy, the situation in the EU and Brexit, the Nordic-German meeting also addressed the current crises and conflicts. “We are all worried about Russia's ever-growing aggressive behavior in our region. That is why we will also discuss how we can promote stability and security in the Baltic Sea. On the issue of Ukraine, we must increase the pressure on Russia to return something to Minsk, while at the same time supporting Ukraine's reform efforts. In addition, we must discuss the current situation in Syria as well as our joint struggle against the so-called Islamic state in Syria and Iraq”, says Kristian Jensen. This page was last edited on 5 December 2016, at 12:48.